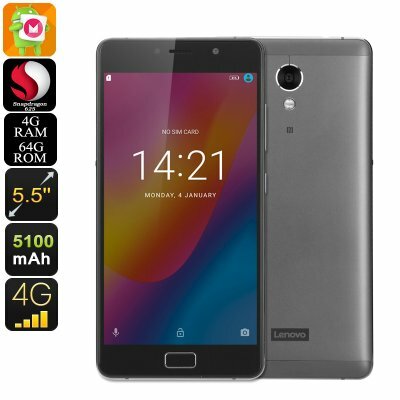 Successfully Added Lenovo Vibe P2 Smartphone - 5.5 Inch FHD Display, Dual-IMEI, 4G, Fingerprint, Snapdragon CPU, 4GB RAM, 5100mAh, 13MP Cam to your Shopping Cart. The Lenovo Vibe P2 is a powerful Android phone that lets you enjoy magnificent power which has been packed within an ultra-sleek and stylish designed body. Coming with Dual-SIM card slots and two IMEI numbers, this Android smartphone will keep you connected at any time. Additionally, it comes with Dual-Band Wifi and 4G connectivity that treats you with the fastest mobile data speeds out there. From now on you’ll be able to browse the web wherever you are without ever needing to worry about a laggy internet connection again. Running on an Android 6.0 OS, the Lenovo Vibe P2 allows you to take on the latest smartphone features while enjoying a smooth and powerful user experience. Within its thin body, this Android phone packs the Qualcomm Snapdragon 625 CPU that brings along all power needed to tackle the most demanding games and applications. This Octa-Core CPU that has been clocked at 2.0GHz comes along with 4GB of RAM – truly providing you with a powerful experience like no other. Whether you’re into watching movies, playing games, or browsing the web – there is nothing this Lenovo Android smartphone can’t handle. Supporting up to 64GB of internal memory and a 128GB SD card slot, this cell phone offers you plenty of space to store all your files and latest downloads. To fully enhance your smartphone experience, this Android phone holds a beautiful 5.5-Inch Full-HD display on which it portraits all your media in stunning 1080p resolution. Along with its Adreno 506 graphics unit, you’ll now be able to enjoy the latest media and most demanding games in breathtaking color and detail. Thanks to its epic 5100mAh battery, you’ll be able to enjoy all the phone’s features for up to 30 hours in a row. This is enough to get through multiple demanding days without needing to worry about your smartphone’s battery life. In order to protect all your personal files and data, this beautiful Android phone comes with an ultra-fast fingerprint scanner. Not only does this security feature offer great protection, it also allows you to unlock your Android device in the blink of an eye. Additionally, this flagship Android smartphone comes with a 13MP rear camera for all the mobile photography lovers out there. Supporting a Sony lens, this camera truly lets you snap stunning images and footage of all those special upcoming moments in life.